ARLINGTON, VA; JULY 11, 2012 – For decades, following her screen debut on WGBH Boston, culinary pioneer and beloved public television icon Julia Child opened up new worlds for generations of Americans, showing them that cooking, even French cuisine, was enjoyable and within reach for all. In celebration of what would have been her 100th birthday on August 15, 2012, PBS will honor Child’s legacy through a multi-platform initiative spanning on-air, online, and social media engagement. The public television celebration of this effort, from August 5 to 15, begins in the kitchen. PBS viewers and Julia Child fans are encouraged to cook their own versions of a classic Julia dish and share the experience through pictures and blogs on PBS Food and by using the Twitter hashtag #CookforJulia. Julia Child content can also be shared through various other social media channels, such as PBS’ Facebook page, PBS Food’s Facebook page, YouTube and Pinterest. 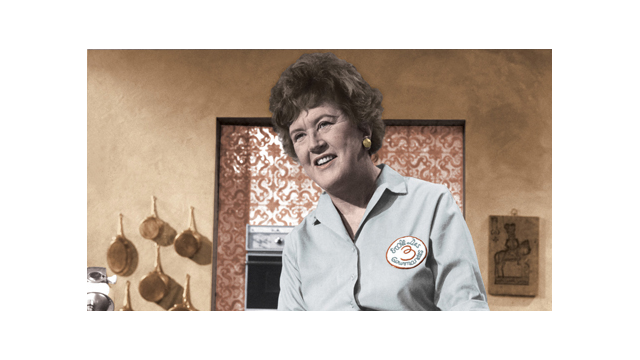 PBS invites fans to visit PBS Food as the home for all Julia Child content and to view nearly 100 exclusive limited-time full episodes from: IN JULIA’S KITCHEN WITH MASTER CHEFS, COOKING WITH MASTER CHEFS, THE FRENCH CHEF CLASSICS, BAKING WITH JULIA and three COOKING IN CONCERT specials, as well as recipes and other fun Julia-related content, including articles, links, quotes and a Julia personality quiz. The broadcast component of the celebration includes an encore presentation of JULIA CHILD MEMORIES: BON APPETIT! as part of PBS’ special August programming, as well as exclusive broadcasts of THE FRENCH CHEF CLASSICS, three episodes of Child’s original program THE FRENCH CHEF, which haven’t aired since debuting in the early 1960s (courtesy of WGBH Boston and distributed by American Public Television [APT]). A Julia Child marathon on August 18 and 19 on public television’s lifestyle channel, Create TV (also distributed by APT), will top off nearly three weeks of birthday activities (check local listings for all programs). Additionally, PBS, Create and APT will honor her legacy through special tributes from well-known food personalities, producers, food bloggers and fans by encouraging the submission of testimonials, video blogs or favorite Julia memories by all who knew her personally or admired her from afar. Fans can visit ShopPBS for a complete collection of all Julia Child cookbooks, THE FRENCH CHEF WITH JULIA CHILD DVDs, biographies and more. Throughout August, ShopPBS will run exclusive promotions, Facebook offers and more, to celebrate 100 years of this culinary icon. The JULIA CHILD’S FRENCH CLASSICS DVD, released on July 3, is available from ShopPBS. About APT American Public Television (APT) has been a leading distributor of high-quality, top rated programming to the nation’s public television stations since 1961. Among its 300 new program titles per year, APT has distributed about half of the top 100 highest-rated public television titles for nearly 10 years. APT programs include prominent documentaries, news and current affairs programs, dramas, how-to programs, children’s series and classic movies. America’s Test Kitchen From Cook’s Illustrated, Rick Steves’ Europe, Doc Martin, Nightly Business Report, Moyers & Company, NHK Newsline, Lidia’s Italy in America, Globe Trekker, Simply Ming, BBC World News and P. Allen Smith’s Garden Home join numerous documentaries and performance programs popular with public television viewers. These programs include: For Love of Liberty: The Story of America’s Black Patriots, Diana Ross: For One and For All, The Best of Soul Train, Johnny Mathis: Wonderful, Wonderful! APT licenses programs internationally through its APT Worldwide service. Now in its 7th year, Create®TV -- featuring the best of public television's lifestyle programming and on the Web at CreateTV.com – is distributed by APT. APT is also a partner in WORLD™, in its 6th year, now featuring a mix of public television’s premier news, science and documentary programming and stories from the world over, with a complementary website at WORLDchannel.org. To find out more about APT’s programs and services, visit APTonline.org. About Create®: Create® is the dynamic TV channel and website featuring the best of public television's llifestyle programming. Create programming spotlights public television's most popular hosts featured in cooking, travel, how-to, gardening and arts and crafts series and specials. Additional content, including the national CreateTV schedule may be found on CreateTV.com, including streaming video, projects, tips, recipes and detailed information about the hosts, programs and special features such as marathon programming. Create is produced and distributed by American Public Television, WNET/New York Public Media and WGBH Boston in association with National Educational Telecommunications Association (NETA)and PBS. For images and additional up-to-date information on this and other PBS programs and initiatives, visit PBS PressRoom at pbs.org/pressroom.